The advent of "new media" (in common parlance, a loose conglomeration of phenomena such as the Internet, digital television, interactive multimedia, virtual reality, mobile communication, and video games), has challenged many scholars to investigate the media culture of late modernity. Research agendas vary from network analysis to software studies; from mappings of the new empire of network economies to analyses of new media as "ways of seeing" (or hearing, reading, and touching). Efforts have been made to pinpoint where the "newness" of social networking, interactive gaming, or data mining lies and to lay the foundations for "philosophies" and "languages" of new media. For some researchers, the main concerns are social or psychological, while for others they are economical and ideological, or motivated by search for technological determinants behind the myriad manifestations of media. As different as these approaches may be, studies of new media often share a disregard for the past. The challenges posed by contemporary media culture are complex, but the past has been considered to have little to contribute toward their untangling. The new media have been treated as an all-encompassing and "timeless" realm that can be explained from within. However, signs of change have begun to appear with increasing frequency. Numerous studies and collections addressing the media's past(s) in relation to their present have appeared in recent years. This influx of historically oriented media studies must be greeted with a cheer. Still, one cannot avoid noticing how little attention has often been devoted to defining and discussing methods and approaches. The past has been visited for facts that can be exciting in themselves, or revealing for media culture at large, but the nature of these "facts" has often been taken as a given, and their relationship to the observer and the temporal and ideological platform he or she occupies left unproblematized. 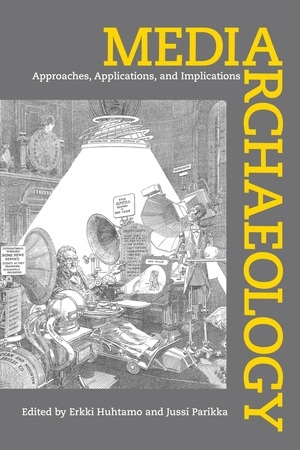 This book aims at amending the situation by introducing an approach-or a bundle of closely related approaches-that has come to be known as "media archaeology." Although this term does not designate an academic discipline (there are no public institutions, journals, or conferences dedicated to it), it has appeared in an increasing number of studies, and university courses and lectures have also been given under this heading. As their highly divergent syllabi and reading lists testify, there is no general agreement about either the principles or the terminology of media archaeology. Yet the term has inspired historically tuned research and is beginning to encourage scholars to define their principles and to reflect on their theoretical and philosophical implications. The purpose of this volume-the first collection of writings on media archaeology published in the United States-is to facilitate this process of self-identification and -definition. No effort will be made to nail down "correct" principles or methodological guidelines or to mark fixed boundaries for a new discipline. Rather than positing an "orthodoxy," the book presents itself as an open forum for very different voices, hoping to trigger "polylogues" about the problems and prospects of this emerging field. It could be claimed that a compilation of texts that have already been published would have served this purpose. The editors have chosen a different path by soliciting new contributions from both seasoned and emerging scholars, asking them to look forward rather than backward and to reflect on their particular take on media archaeology. To set the stage, work that has already been done will be reviewed in this introduction, a tentative mapping of an "archaeology of media archaeology." Concentrating solely on cases where the words media archaeology have been explicitly enounced would have been too limiting. It is also important to acknowledge work that has not defined itself as "media archaeology" but nevertheless has shared similar interests and goals. Michel Foucault's writings have been an important formative experience for many media archaeologists. However, there are other theoretical and critical contributions that have contained seeds of media archaeology. Theorists and historians such asWalter Benjamin, Siegfried Giedion, Ernst Robert Curtius, Dolf Sternberger, Aby Warburg, and Marshall McLuhan were all in some ways "media archaeologists" avant la lettre. More recently, the debate on new historicism has brought up themes and motifs that occupy media archaeologists as well. It could be claimed that media archaeology is new historicist in its essence, but this would be too gross a generalization. A wide array of ideas have provided inspiration for media archaeology. Theories of cultural materialism, discourse analysis, notions of nonlinear temporalities, theories of gender, postcolonial studies, visual and media anthropology, and philosophies of neo-nomadism all belong to the mix. What is it that holds the approaches and interests of the media archaeologists together, justifying the term? Discontent with "canonized" narratives of media culture and history may be the clearest common driving force. Media archaeologists have concluded that widely endorsed accounts of contemporary media culture and media histories alike often tell only selected parts of the story, and not necessarily correct and relevant parts. Much has been left by the roadside out of negligence or ideological bias. For the media critic Geert Lovink, media archaeology is by nature a "discipline" of reading against the grain, "a hermeneutic reading of the 'new' against the grain of the past, rather than telling of the histories of technologies from past to present." Media archaeologists have challenged the rejection of history by modern media culture and theory alike by pointing out hitherto unnoticed continuities and ruptures. As a consequence, the area for media studies has been pushed back by centuries and extended beyond the Western world. On the basis of their discoveries, media archaeologists have begun to construct alternate histories of suppressed, neglected, and forgotten media that do not point teleologically to the present media-cultural condition as their "perfection." Dead ends, losers, and inventions that never made it into a material product have important stories to tell. Media archaeology should not be confused with archaeology as a discipline. When media archaeologists claim that they are "excavating" media-cultural phenomena, the word should be understood in a specific way. Industrial archaeology, for example, digs through the foundations of demolished factories, boardinghouses, and dumps, revealing clues about habits, lifestyles, economic and social stratifications, and possibly deadly diseases. Media archaeology rummages textual, visual, and auditory archives as well as collections of artifacts, emphasizing both the discursive and the material manifestations of culture. Its explorations move fluidly between disciplines, although it does not have a permanent home within any of them. Such "nomadicism," rather than being a hindrance, may in fact match its goals and working methods, allowing it to roam across the landscape of the humanities and social sciences and occasionally to leap into the arts. Media archaeology may-and perhaps it should-develop into a "traveling discipline," to refer to an idea proposed by Mieke Bal. Probably the first scholar to develop a media-archaeological approach and give it that name was Jacques Perriault in his Mémoires de l'ombre et du son: Une archéologie de l'audio-visuel (1981). As the title of the book reveals, his "archaeology of audiovisuality" was occupied with both visual and auditory media of the past. Perriault analyzed the relationship between what he called "use function" and "social representation." He also discussed the relationships between the technologies of the past and contemporary forms, emphasizing that he did not want his work to be seen as an "escape into history," motivated by fear of contemporary media practice. That Perriault did not consider himself a professional historian may have contributed to the unprejudiced flexibility of his approach. Years before Perriault, the word archaeology had been used in the title of C. W. Ceram's Archaeology of the Cinema (1965). Ceram, whose real name was Kurt Wilhelm Marek (1915-72), was a well-known popularizer of archaeology. Yet applied to the prehistory of cinema his idea of "archaeology" hardly differed from the goals of traditional positivistic historical scholarship. Ceram presented a strictly linear and teleological account about the developments that led to the cinema, breaking off his narrative in 1897, the year that, according to him, "saw the birth of the cinema industry." Ceram focused on inventors and the technical steps that led to cinematography. Everything that did not fit neatly into this narrative was left out, no matter how interesting it might otherwise have been. The illustrations, selected by the British scholar Olive Cook (mostly from the great collection of John and William Barnes), told an entirely different story, pointing out phenomena and potential connections omitted by Ceram. This was an interesting rupture, embodying a tension between two very different notions about the history of the moving image. The word archaeology later appeared in the title of Laurent Mannoni's Le grand art de la lumière et de l'ombre: Archéologie du cinéma (1994). A change of emphasis is clear. Based on an extensive consultation of archival material (which justified the use of the word archaeology), Mannoni's book no longer tried to present a closed historical narrative arranged as a set of interconnected causal chains inevitably leading toward cinema. Rather, the five-hundred-page volume consists of a succession of carefully researched case studies of different facets of the moving image culture, covering several centuries. Although there is a strong emphasis on technology, Mannoni also discusses its applications and discursive manifestations. Piece by piece, a narrative develops, but one that does not pretend to be complete or to hide its gaps. Although Mannoni's discourse stays close to the sources, avoiding theoretical speculation, the book invites new insights, opening paths for further interpretations. However, these pioneering works represent only one of the possible roads toward media archaeology. The emergence of modern media technology from the nineteenth century onward and its growing prominence over minds in the mass society led to a need to analyze its nature and impact. The sense of urgency often led early scholars to concentrate on contemporary issues with political and social implications, leaving less room for "media-archaeological" concerns. The critiques of mass media developed by Theodor W. Adorno and Max Horkheimer in their Dialectic of Enlightenment (1944) and by Richard Hoggart in his Uses of Literacy (1957) are good examples of this. When these authors turned to the early histories of media, they were often occupied with reconstructing their technological and industrial development, and-as in the case of photography and cinema-arguing for their potential as new art forms. Inventors and industrialists played prominent roles. The structure was usually linear, and different media forms were normally discussed in isolation from each other. Marshall McLuhan introduced a new approach, new combinations, and new themes to the study of media. His early work The Mechanical Bride (1951) developed a critique of contemporary mass media, drawing occasional parallels with mythology and history, and shifting between high culture and popular culture with apparent ease and (and some took it) recklessness. In The Gutenberg Galaxy (1962) McLuhan's vision came to embrace the history of media in a more rigorous sense as he traced the dynamics between orality, the Gutenbergian printing revolution, and the new orality represented by televisual media. Instead of providing a neutral and linear narrative, McLuhan's idiosyncratic discourse surfaced as an essential element. The materiality and the processual nature of his discourse was further emphasized in the collagelike books (The Medium Is the Massage, War and Peace in the Global Village, and Counterblast) that he produced with the graphic designer Quentin Fiore following the international success of Understanding Media: The Dimensions of Man (1964). McLuhan's influence on media archaeologists has been manifold. Of utmost importance is his emphasis on temporal connections, translations, and mergers between media, something that inspired Jay David Bolter and Richard Grusin to develop their notion of "remediation" and to use it to investigate how features of earlier media forms are subsumed into digital media. Bolter's and Grusin's endeavor was not defined as "media archaeology," but it has affinities with the ways media archaeologists draw parallels between seemingly incompatible phenomena. McLuhan's understanding of "media" and "medium" was broad and challenged existing dichotomies, like those between material things and notions of the mind. His ideas of new media as "extensions" and as driving forces for changes in society have influenced the German "media materialist school" of media archaeology through the work of Friedrich Kittler. Last but not least, McLuhan's unwillingness to stick with formal "methods" and fixed sets of concepts, as well as his self-reflective play with his own discourse, seems to appeal to "anarchistically minded" media archaeologists, determined to keep their approaches free from institutional-theoretical dogmas and infections. Early media scholarship was associated with research on the impact of technology on human civilizations, typified by Lewis Mumford's classic Technics and Civilization (1934). Siegfried Giedion's Mechanization Takes Command (1948) presented a detailed account about the forms and impact of mechanization. Ranging from techniques for capturing human movements as graphic representations to the features of everyday household objects like the bathtub, Giedion's history had less to do with isolated apparatuses than with their interconnections. Mechanization was presented as a depersonalized force that infiltrated Western societies down to the minutest details of everyday life. Giedion was mainly concerned with material culture, "the tools that have molded our present-day living." The "anonymous history" he proposed looked for a synthesis between Geistesgeschichte and positivism, where every detail was "directly connected with the general, guiding ideas of an epoch. But at the same time it must be traced back to the particulars from which it rises." Even earlier, the German cultural critic Walter Benjamin had already projected a kind of anonymous history, but one that involved discursive layers of culture to a much greater extent than Giedion's largely materialist vision. Benjamin is arguably the most prominent forerunner-beside Foucault-of media-archaeological modes of cultural analysis and is a major influence for cultural studies. In particular, his unfinished Arcades Project (Passagen-Werk) became a case study about the kinds of issues media archaeologists deal with. Benjamin's reconstruction of nineteenth-century culture, with Paris as its capital, relied on a multitude of sources, including texts, illustrations, urban environments, architecture, public spectacles like the panorama and the diorama, and objects deemed to be emblematic of the era. The approach was remarkably open, shifting, and layered and took political and economic but also collective psychological factors into consideration. Beside material forms, Benjamin's work illuminated the "dream worlds" of consumerism and early modernity. Working against the tidal wave of Geistesgeschichte, Benjamin refused to group the massive evidence he had gathered under any single symbol deemed characteristic of the era. Such persistence is one of the reasons why the work remained unfinished. The readers were left with a huge collection of notes, images, and ideas that constitute a database rather than a preorganized narrative. Benjamin offered meditations on time, spatiality, nature, and emergent modernity as a new realm of sensations. The concept and method of allegory that he had already developed in his earlier work referred to alternative ways of seeing temporality not as an organic succession but through the figures of ruins and decay. The interest in change and the "ruins" of the body and mind were evident in his other works as well, which famously touched on historical changes in the modes of perception. Dolf Sternberger's Panorama of the Nineteenth Century, originally published in German in 1938, also anticipated issues that became important to media archaeology. At first glance it bears similarities with the Arcades Project because of the way it draws from a multitude of sources to paint a portrait of an era. Both Benjamin and Sternberger were interested in the panorama as a visual manifestation of the nineteenth-century culture. However, their approaches differ in important respects. For Benjamin the panorama was just one of the manifestations of the larger topic he was trying to get hold of, while for Sternberger it became nothing less than the organizing metaphor for his portrait of an era, the key to unlock the secrets of, in the words of his book's subtitle, "how nineteenth century man saw himself and his world and how he experienced history." In his book Sternberger deals less with concrete panoramas than with their manifestations in cultural phenomena as diverse as steam power, railway travel, the Western idea of the Orient, the theory of evolution, and domestic lighting. While this totalizing idea clearly derived from the ideology of the Geistesgeschichte, it may also bear certain similarities with the ways Foucault dealt with his "epistemes." In the early decades of the twentieth century, art history also began proposing ways of recontextualizing art within textual traditions and expanding its own reach to visual material that had traditionally been left outside its confines. A reevaluation of "neglected traditions" has been proposed by Horst Bredekamp, who has related the theories of Bildwissenschaft that emerged in Germany to pioneering approaches toward technology and media in the early twentieth century. Around 1900-1933, according to Bredekamp, a new "science of the image" emerged in the German-speaking world with radical ideas about the continuities between different genres of images from advertisements and photography to film and political iconography. The art historian Aby Warburg and scholars he influenced, like Ervin Panofsky and E. H. Gombrich, stood out as "picture-historians," interested more in recurring visual motifs and their contextualization than in weeding the popular out of art history. Warburg's unfinished "Mnemosyne Atlas" (which in some ways resembles Benjamin's Arcades Project) suggested a nonlinear way of understanding the temporal recurrence of images and their relations, raising also the issue of "intermediality" by pointing out motifs that shifted and transformed across what we would now call media platforms. Furthermore, the project suggested a new idea about dynamics of the image, pointing out how images and motifs in themselves could function as "time-machines" in an isomorphic fashion to the task of media archaeology. Another unconventional work that anticipated some of the concerns of media archaeology was André Malraux's Musée imaginaire (trans. Museum without Walls), published in 1947. Malraux discussed the ways in which mechanical reproduction, in particular photography, was changing our understanding of images and visual culture in general (without referring to Benjamin's "Work of Art in the Age of Mechanical Reproduction," 1936). He demonstrated how the unprecedented availability of reproductions was turning the past into an archive, and he challenged observers to draw connections between visual traditions and motifs that had until then been considered unrelated. The work of Michel Foucault has had a strong impact on media archaeology. An archaeology of his "archaeology of knowledge" would be useful but cannot be developed here. When classifications of media archaeology have been attempted, a binary division has usually been drawn between the socially and culturally oriented Anglo-American studies and the techno-hardware approach of German scholars, who have taken their cue from Friedrich Kittler's synthesis of Foucault, information theory, media history, and McLuhan's emphasis on the medium as the message. The German tradition has been claimed to emphasize the role of technology as a primum mobile, which has led to accusations about technological determinism, whereas Anglo-American scholars often assume that technology gets its meanings from preexisting discursive contexts within which it is introduced. One way of explaining this division is to see it as a consequence of different readings of Foucault. The Anglo-American tradition has valorized Foucault as a thinker who emphasized the role of discourses as the loci where knowledge is tied with cultural and social power. Material bodies, events, and institutions are all conditioned by discursive formations. The effects of "hard" technology are considered secondary to immaterial forces that differentiate and mediate their uses. We find quite different readings of Foucault in the German variant of media archaeology, which was strongly influenced by Kittler's Aufschreibesysteme 1800/1900 (1985), his pathbreaking habilitation thesis that dealt with the impact of technical media on nineteenth-century literature and writing practices. It was followed by Grammophon Film Typewriter (1986), which shared the same basic premises but focused more directly on technical media. Kittler argued for the need to adjust Foucault's emphasis on the predominance of words and libraries to more media-specific ways of understanding culture. According to him, the problem was that "discourse analysis ignores the fact that the factual condition is no simple methodological example but is in each case a techno-historical event." To be able to understand media technologies from the typewriter to the cinema and on to digital networks and coding paradigms, one must take their particular material nature into consideration-an idea Kittler's followers like Wolfgang Ernst have adopted for their own work. It was probably in this sense that Michael Wetzel purported to combine Foucault and Kittler in his "preliminary considerations for an archaeology of the media," published in 1989 in a collection of writings that already bore the words "archaeology of the media" in its title. However, Kittler never claimed he was focusing solely on technology or technical apparatuses. From early on he emphasized the role of institutions as nodes in the networks of technical media. Although he has often been seen as part of a generation of German humanists determined to steer media theory away from meaning and interpretation, Kittler did not neglect the power-related implications of technology. There is a "brand" of German media theory that emphasizes the "epistemic effects of media in the production and processing of knowledge" and "the medial dimensions of the mechanisms of power," as the editor of a recent issue of Grey Room explained. To prevent the application of simple binary models to his work and his intellectual position, Kittler has denied any affiliation with the notion of media archaeology. His more recent work has returned to a more Heideggerian-inspired excavation of the history of Western culture through music and mathematics. Anglo-American media archaeologists-whether identifying themselves as such or not-have received impulses from the new historicism that emerged in the 1980s. Although it appeared first within literary scholarship, it soon spread to other areas, including history, where it inspired a movement known as the new cultural history. Among other sources, the new historicism was also influenced by Foucault, although his ideas were by no means approved without debate. H. Aram Veeser aptly summarized its "key assumptions" by stating "1) that every expressive act is embedded in a network of material practices; 2) that every act of unmasking, critique, and opposition uses the tools it condemns and risks falling prey to the practices it exposes; 3) that literary and non-literary 'texts' circulate inseparably; 4) that no discourse, imaginative or archival, gives access to unchanging truths or expresses inalterable human nature; 5) finally ... that a critical method and a language adequate to describe culture under capitalism participate in the economy they describe." Applied to historical scholarship, the new historicism promoted a self-reflexive and discourse-oriented approach that frequently drew on neighboring disciplines, including the symbolic anthropology of Clifford Geertz, and the rather amorphous field of cultural studies. A kind of double focus developed: on the one hand, historians were supposed to immerse themselves in the past, observing it as if by the eyes of the contemporaries; on the other hand, they were supposed to be constantly aware of their observation post in the present, with all the ideological implications it entailed. The research process shifted constantly between the facts of the past, in the process of forming themselves into meaningful constellations, and the subjectivity of the observer. The historical explanation was formulated on/as a dynamic field with multiple determinants that were dynamic rather than static. Media-archaeological works that are developed under the influence of such modes of thinking assess the material and the technological through their discursive manifestations. Giuliana Bruno's Atlas of Emotion: Journeys in Art, Architecture, and Film (2002) created a network of "journeys" across history (treated as a place or a map) in a non-linear fashion, triggered by the author's "e-motions" (and illness). The observing and sensing subject became the organizing entity for highly heterogeneous material, giving the book at times a fiction or diary-like quality, although it was defined as a "cultural history." Another, although less subject-centered, example is Jeffrey Sconce's Haunted Media: Electronic Presence from Telegraphy to Television (2000), which explored discourses of the supernatural in the context of telecommunications and broadcasting media. Although Sconce defined his work as "a cultural history of electronic presence," his concern with the electronic presence as a changing social construct, as well as his analysis of the continuities and ruptures manifested by the "familiar stories that appear in new incarnations with the advent of each new medium," was clearly media-archaeological. Siegfried Zielinski's version of media archaeology is a practice of resistance, not only against what he perceives as the increasing uniformity of mainstream media culture, but also against media archaeology itself, or rather its assimilation and hardening into the normalcy of contemporary media studies. Considering media archaeology a "method" pinned down into an academic textbook would no doubt be a horror for Zielinski, who also calls his "activity" (Tätigkeit) by other names, such as "anarcheology" and "variantology," expressing an uneasiness toward permanent categories and doctrines. For him, media archaeology "in a pragmatic perspective means to dig out secret paths in history, which might help us to find our way into a future." This formulation reveals the utopian and Romantic underpinnings of Zielinski's thought, which is not without-productive?-contradictions. Zielinski's early work was not yet identified as "media-archaeological." Zur Geschichte des Videorecorders (On the History of the Video Recorder, 1986) was a dense and detailed exploration of the topic, covering technological, institutional, and economical as well as sociocultural issues. It also contained a special section, "Aspects of the Video Recorder in Pictures," a kind of visual essay that already pointed toward media-archaeological interests. His next major book, originally published in 1989 and translated as Audiovisions: Cinema and Television as Entr'actes in History, defined itself as an "outline of a history of audiovision" (Entwurf zu Geschichte der Audiovision), or a contribution toward to "an integrated history of the media" (integrierte Mediengeschichte). Drawing on an enormous mass of highly heterogeneous source material, the book demonstrated how distinctions between different audiovisual media were gradually erased during the twentieth century. Inspired by the work of Kittler, a discussion on the archaeology of the media was emerging in Germany in the late 1980s, but Zielinski was obviously not yet part of it; his influences were quite different. Although the theoretical construct behind Audiovisions was more implicit than explicit (as Zielinski himself admitted), he singled out the triad "technology-culture-subject," identifying each of its elements with a recent intellectual tradition that had influenced him: the British cultural studies represented by Raymond Williams; the German historiography of technology that used a specific systems approach (Günter Ropohl); and the metapsychological cinema theories of Jean-Louis Baudry, Jean-Louis Comolli, and Christian Metz, which emphasized the notion of the cinematic apparatus. Zielinski stated that he did not want to "compete with other models that emphasise more strongly the techno-structure of media processes (like, for example, those of Friedrich Kittler and his pupils)," seeing his own as "supplementary." Zielinski's road from Audiovisions to media archaeology seems logical. His project had taken him to "the end of the history of cinema and television," where he saw only uniformity and unlimited industrial exploitation, surprisingly much in line with Adorno's and Horkheimer's position. "New media" did not provide relief, as their possibilities were mostly used to remediate and perpetuate hegemonic forms. Zielinski began turning toward two seemingly opposite directions that in the end pointed to the same goal, offering to break the psychopathia medialis of modern media culture. On the one hand were radical contemporary artists, who had potential to break the vicious goals of the culture industry; on the other were the hidden treasures of the past that might provide keys for a cultural renewal. Zielinski's position was influenced by his role as the founding director and later rector of the Academy of Arts and the Media in Cologne, which gave him an opportunity to build connections between media studies and experimental media practices. Zielinski's next book, translated as Deep Time of the Media: Toward an Archaeology of Hearing and Seeing by Technical Means (originally published in 2002), plunged into the "deep time" of media, offering a series of studies that were dedicated to the work of personalities who had rarely been associated with media culture before and were written in "a spirit of praise and commendation, not of critique." Empedokles, Athanasius Kircher, Cesare Lombroso, and others provided examples of genial individuals who worked out of love and inspiration against the odds of the real world. In Zielinski's mind at least, they shared a kinship with another set of cultural heroes, contemporary artists working with media, such as Valie Export, David Larcher, Nam June Paik, Steina and Woody Vasulka, and Peter Weibel. Ideologically Zielinski almost seems to nod toward Thomas Carlyle's Romantic classic On Heroes and Hero Worship and the Heroic in History (1841). He plunges headlong, and with pathos, into the world of his heroes, eschewing critical, skeptical, and theoretically oriented perspectives. Zielinski's understanding of media is unconventional in its openness (perhaps unintentionally recalling McLuhan's amoebic definitions), and his intellectual appetite bottomless. His recent ongoing project named Variantology, a series of anthologies based on international workshops, seems to have been calculated to take his plea for a radical heterogeneity to a new level. Its keywords are well expressed by translations of the Latin verb variare: "to be different, to deviate, to change, to alternate, to modify." Variantology, like his brand of media archaeology, favors "local" explorations, refusing to develop them into overarching explanations such as the ones coined by historically leaning visual theorists like Jonathan Crary. Zielinski's pleas for openness, curiosity, and "traffic" between disciplines are commendable, but his apparent resistance to systematization and theorization runs the risk of atomism. The "new film history" can arguably be seen as a parallel enterprise to media archaeology; both have their origins in the 1980s and are continuing to evolve. Although the profile of the former is far from clear, many of its practitioners sought new insights into the specific nature of cinema by introducing extended cultural, social, and economic contextualization, based on the consultation of varied firsthand source material, and by emphasizing cinema's intermedial relationships. In a way Zielinski's Audiovisions also pointed in this direction, but it went beyond the horizon of most film historians by focusing on the interplay between technology, cultural forms, and viewing subjects and by paying little attention to the content of films or television programs; the context and the technological apparatus were given center stage. Sound, for instance, since the silent cinema was rarely if ever silent, in which case: why is the history of the phonograph not listed as another tributary? And as we now understand the cinema as part of a multimedia environment, how about the telephone as an indispensable technology? Radio-waves? Electro-magnetic fields? The history of aviation? Do we not need Babbage's difference engine ranged parallel to his friend Henry Fox-Talbot's Calotypes or Louis Daguerre's sensitised copper plates? These questions in themselves show how much our idea-and maybe even our definition-of cinema has changed even without appealing to digitization as a technology, which is nonetheless implicit as a powerful "perspective correction" and thus counts as an impulse in this retrospective re-writing of the past. According to Elsaesser, one of the goals of the new film history has been to explore the peculiar nature of the cinematic experience up until around 1917. Tom Gunning's writings on the cinema of attractions, Charles Musser's work on the history of screen practice, and André Gaudreault's explorations of early optical media are representative examples. Gunning has also published many studies linking early cinema to other media, technological phenomena like ghost photography and X-rays, and institutions of emerging modernity, such as the World's Fairs. Similarly, in Window Shopping (1993) Anne Friedberg traced the origins of cinema to forms and institutions of the emergent popular and consumer culture of the nineteenth century, creating an approach that clearly raised media-archaeological concerns. In The Virtual Window (2006) she pushed her analysis back by hundreds of years, further estranging it from the cinema studies paradigm. For Elsaesser, one of the challenges is the reevaluation of the connections and gaps between media technologies. The onslaught of digitalization is forcing cinema to rethink both its cultural position and its history. Considering digitality as a rupture provides a conceptual way of seeing media history as a discontinuous enterprise subject to constant reevaluation. Lev Manovich's The Language of New Media (2001) was a historically tuned version of new media theory that built on cinema studies and film theory. It purported to place the new media "within the history of modern visual and media cultures." Manovich pointed out continuities between early avant-garde and animation film practices and the emerging digital culture, based on numerical representation, modularity, automation, variability, and transcoding. Beside film history and theory, he drew on the traditions of the Bildwissenschaft, including the work of Ervin Panofsky. The focus on new media changes the historical meaning and context of cinema from narrative cinema to one flexible enough to lend itself to interactivity, navigability, and digital representation and transmission. Media-historical and theoretical works with a background in film studies pose a challenge for the continued renewal of media archaeology. How does one avoid reducing all other media to a footnote to the history of the moving image? One alternative is the recent influx of archaeologically oriented works concentrating on the audible dimension of culture and history. Media archaeology may not have organized itself as a discipline; it may be loitering at the periphery of institutions and drawing the attention of career academics previously devoted to established disciplines; occasionally it may forget to define its own identity, or even ignore it, being still in the process of self-discovery. Yet media archaeology is already much more than a footnote to Foucault's or Kittler's work. One should not forget Bernhard Siegert's studies on the postal system, Wolfgang Ernst's research on the archaeology of technical media and of archives, Claus Pias's studies on the historic constellations of computer games, or Jussi Parikka's archaeologies of computer viruses and "insect media," let alone scholarly works that can be identified as "media-archaeological" even though they never identifies themselves as such. Emphasizing such heterogeneity is an attempt not so much to deliberately diversify the existing body of media-archaeological theory and praxis as to encourage "traveling" between discourses and disciplines. Still, amid all the variety, there is a need to define approaches and perhaps even to crystallize them into "methods," at least in a local and tactical sense. Erkki Huhtamo's variant of media archaeology is one such attempt, stemming from an effort to apply the idea of topos, as developed by the German literary scholar Ernst Robert Curtius in his classic Europäische Literatur und lateinisches Mittelalter (1948), to the field of media culture. The topos approach eschews "the new," which is so often the focus of media-cultural discourses, both critical and popular; instead, it emphasizes the clichéd, the commonplace, and "the tired" (to appropriate jargon from WIRED magazine). Identifying ways in which media culture relies on the already known is just as essential as determining how it embodies and promotes the never before seen. In fact, these two aspects are connected with each other; the new is "dressed up" in formulas that may be hundreds of years old, while the old may provide "molds" for cultural innovations and reorientations. Huhtamo's approach does not only identify topoi, trace their trajectories, and explore the circumstances of their reappearances. It also purports to demonstrate how topoi are constantly evoked by cultural agents, from spokespeople, sales agents, and politicians to writers, journalists, exhibition curators, and, last but not least, media artists, who use them for various kinds of purposes, from sales pitches and ideological persuasion to aesthetic reflections on media culture and history. This emphasis gives Huhtamo's approach a culture-critical character. Although the cultural agents themselves may not always acknowledge it, the media-archaeological dimension is an essential element of the contemporary mind-set, constantly bombarded by media and communications. By demonstrating how the media's past(s) lives on in the present, guiding and informing people's attitudes in their daily lives, the topos approach helps to detect novelties, innovations, and media-cultural ruptures as well. As Huhtamo had already pointed out in 1996 in his essay "Time Machines in the Gallery: An Archeological Approach in Media Art," a growing number of artists who are aware of media archaeology get inspiration from its findings and are contributing their own creations and discoveries. This has led to intriguing parallels and connections between research and artistic creativity. Artists like Paul DeMarinis and Toshio Iwai have used their media-archaeological explorations to construct alternate and hypothetical media histories, while others, such as Zoe Beloff, Heidi Kumao, Rebecca Cummins, and Ellen Zweig, have imagined the psychological and/or gender-specific implications of technologies of the past, visualizing them with their re-creations. Still others have reproduced idiosynchronic versions of "obsolete" media, unleashing their unexplored potential; Ken Jacobs, Bernie Lubell, and Gebhard Sengmüller are representative examples. Iwai, DeMarinis, and Julien Maire have also used media archaeology as an inspiration for astonishing high-tech creations, such as Iwai's Elektro-Plankton (for Nintendo DS) and TENORI-ON, DeMarinis's Rain Dance and Firebirds, and Maire's Demi Pas, a twenty-first-century version of the magic lantern show. These works do not necessarily even reveal their media-archaeological inspiration at first look, yet they create a cyclical motion in a way many media archaeologists no doubt endorse. There is no separation; instead, there is constant interchange, a cruise in time. The past is brought to the present, and the present to the past; both inform and explain each other, raising questions and pointing to futures that may or may not be. This book introduces an archaeological approach to the study of media - one that sifts through the evidence to learn how media were written about, used, designed, preserved, and sometimes discarded. Edited by Erkki Huhtamo and Jussi Parikka, with contributions from internationally prominent scholars from Europe, North America, and Japan, the essays help us understand how the media that predate today’s interactive, digital forms were in their time contested, adopted and embedded in the everyday. Providing a broad overview of the many historical and theoretical facets of Media Archaeology as an emerging field, the book encourages discussion by presenting a full range of different voices. By revisiting ‘old’ or even ‘dead’ media, it provides a richer horizon for understanding ‘new’ media in their complex and often contradictory roles in contemporary society and culture. Erkki Huhtamo is Professor of Design | Media Arts at the University of California, Los Angeles. Jussi Parikka is Reader at Winchester School of Art (University of Southampton, UK) and the author of Digital Contagions: A Media Archaeology of Computer Viruses and Insect Media: An Archaeology of Animals and Technology. "Taken together, this excellent collection of essays by a wide range of scholars and practitioners demonstrates how the emerging field of media archaeology not only excavates the ways in which newer media work to remediate earlier forms and practices but also sketches out how older media help to premediate new ones." "A long-awaited synthesis addressing media archaeology in all of its epistemological complexity. With wide-ranging intellectual breath and creative insight, Huhtamo and Parikka bring together an eminent array of international scholars in film and media studies, literary criticism, and history of science in the spirit of making the discourse of the humanities legible to artist-intellectuals. This foundational volume enables a sophisticated understanding of reproducible audiovisual media culture as apparatus, historical form, and avant-garde space of play." "An essential read for everyone interested in the histories of media and art." "Media archaeology is a wonderful new shadow field. If you are willing to step outside the glow of new media, this book's approaches can shift how you experience the objects and experiences that fill the new everyday of contemporary life. No one captures the beauty of studying new media in the shadow of older media implements and practices better than Erkki Huhtamo, the Finnish writer, curator, and scholar of media technology and design famous for his creative work as a preservationist and an interpreter of pre-cinematic technologies of visual display. He has teamed up here with Jussi Parikka, the Finnish scholar who has brought us an insect theory of media, to give us this long-awaited collection of essays in media archaeology. The surprise of the book is that the essays collectively bring forward a range of approaches to considering archaeological practice, giving us new ways to think about our embodied and subjective orientations to technologies and objects through the lens of the material remnants of practice, rather than offering a narrow definition of the field. The collection moves between computational machines and influencing machines, preservation and imagination, offering a range of ways to live the new everyday of media experience through the imaginary of archaeology." “Here, at last, is a collection of essays that are a critical step to comprehending the history of our impulse to see ourselves in the machines we have made. This could be the beginning of 'Archaeology of Intention.'" “Huhtamo and Parikka’s expertly curated collection is a kaleidoscopic tour of media archaeology, giving us forceful evidence of that unruly domain’s vitality while preserving its wonderful unpredictability. With this essential volume, countless new paths have been opened up for media and cultural historians."